Looking for fencing classes in London? 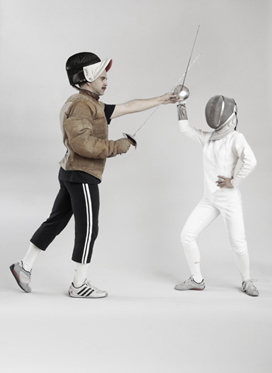 Our beginners' fencing classes cover the basics of fencing and are the ideal taster of the sport. They are suitable for people who haven't previously taken fencing lessons, or for those who fenced a long time ago and would like to return to the sport. The participants of the beginners' classes are introduced to fencing rules, traditions, techniques and tactics. While learning the bladework, fencers exercise in pairs or with the coach. Acquired skills are practised further during the fencing bouts. All elements are taught slowly and repeated often to ensure that students grasp the move - as well as understanding when it should be executed! By the end of the course the participants should have acquired general knowledge of the sport and feel competent to bout with the more experienced fencers. Suitable for: Ages 15 - 60, women and men, complete beginners or returners. Equipment: Fencing equipment will be provided, just bring t-shirt, track suit bottoms and trainers. Flexibility: OK to switch between classes of the same week occasionally. Introductory fencing class for beginners: 6 weekly lessons. 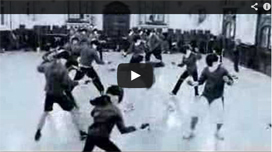 Master thrusts, parries, ripostes and prise de fer! This course will run on Monday or Thursday evenings. You can swap between classes which started on the same week. For example, having signed up for the Monday course you'll be able to switch to the Thursday session occasionally. This course is suitable for complete beginners and ideal if you wish to relieve stress and get some exercise after a day in the office: learn fencing, get fit and make new friends! Book by 25 April and get 35% off the normal price! Covering all the elements described above, this class takes place on early Friday evenings. It's possible to swap with the 7 pm Monday or Thursday groups if they run on the same week (subject to places availability), so it's not a problem if you cannot make one evening. Suitable for complete beginners and ideal if you wish to relieve stress and get some exercise after a day in the office: learn fencing, get fit and make new friends! Venue: Finsbury Leisure Centre, Norman Street, London EC1V 3PU(Map). Set of two workshops, 2 hours each. These intensive workshops for beginners will run on two Saturdays, 2 hours each. They will provide a good workout while covering all important fundamentals of fencing. You do not need to be as strong as the famous musketeer to take part in this crash event but you might feel his type of appetite after the class! The class will be held from 12.30 pm to 2.30 pm (with a short break). Next set of workshops: 11 and 18 May 2019. Book by 25 April and get 20% off the normal price! Individual lessons are the ultimate experience of fencing training. The master will be working exclusively with you and, if you have one, your fencing partner. The programme which will be tailored to your personal needs, style and temperament would normally consist of 4 x 1 hour fencing lessons. The dates: arranged individually, on week evenings or on Saturday afternoons. Venue: Finsbury Leisure Centre, London, EC1 or Gymnasium of Central Foundation Boys' School, London, EC2. Only £273 for a couple taking lessons together! Bring 2 friends along and pay only 50% of the course fee! Bring 3 friends and take the course for FREE ! Fencing courses make original and healthy presents! 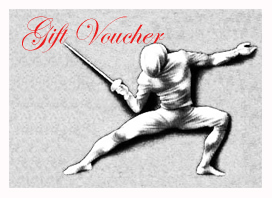 Order a fencing Gift Voucher here!